Ffynnon Drillo is marked on the Ordnance Survey maps about a mile and a half to the south west of Llansannan village. This is also the sum of the information Jones (1954) is able to provide concerning the well too. In the article on St Trillo, in their Lives of the British Saints, Baring Gould and Fisher mention that at one time there must have been a well dedicated to the saint at Llansannan, but all that remains (at the start of the twentieth century) is a ruined house bearing the name Ffynnon Drillo. Maps from this period show the location of a building and a well beside it. The Coflein database, the record of the Royal Commission on Ancient and Historical Monuments of Wales suggests that the well is surrounded by rough masonry or brickwork, however the reference cited is the survey of 1912 and no more recent documents are recorded. It was described then as a spring rising from the lower side of a bank into a basin of rough masonry some three feet square. 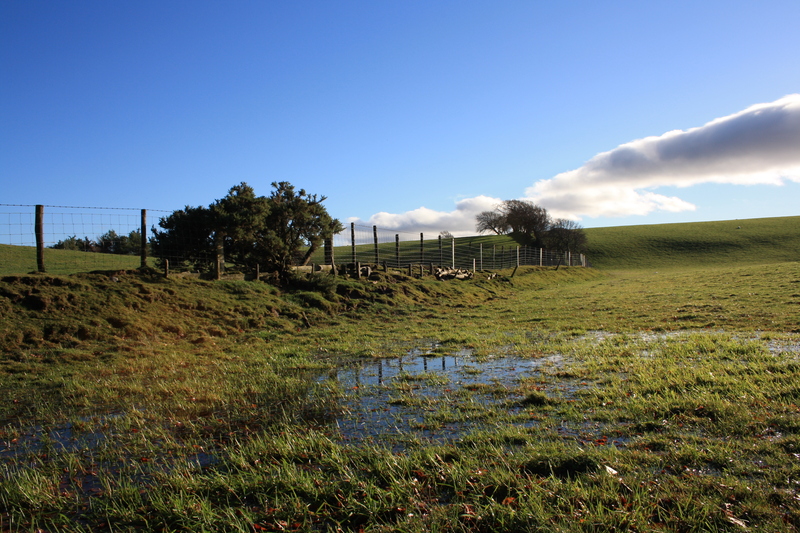 There is no mention of the well on the website of Cymdeithas Ffynhonnau Cymru, although they do preserve the memory of a well associated with cow pox in Llansannan, but is unable to provide a location for the site. Thus, with this background, we did not expect to find anything significant at the location marked on the map. 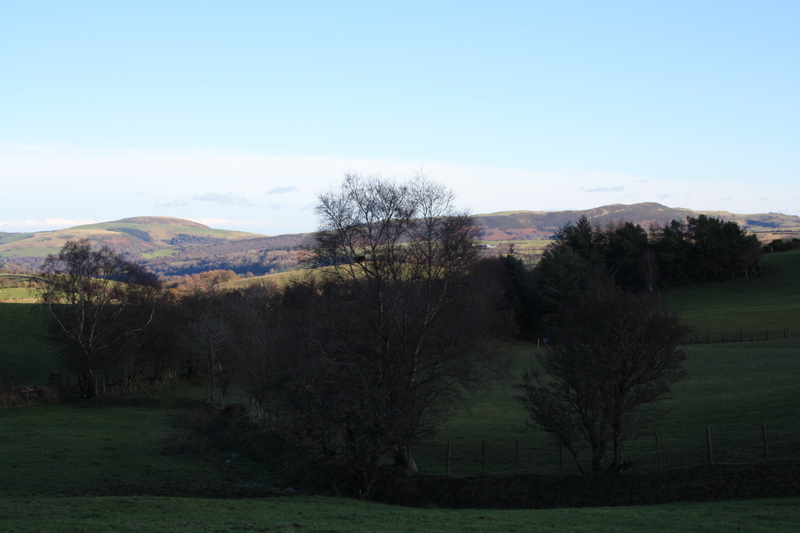 The site is in a small field just off the B5382 that climbs up to Gwytherin from Llansannan. 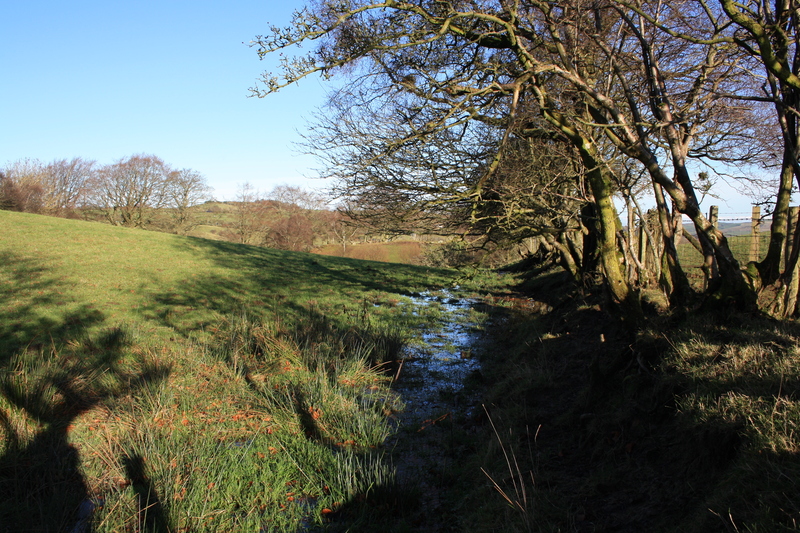 The field slopes down steeply towards a stream that runs along the field boundary. No trace of the house now remains, although with the aid of a large scale map from 1900 it is possible to determine more or less where it stood, and with a little optimism assume a flattish rectangular area at the foot of the slope would be a suitable place for the building. The 1900 map marks a well beside the house, and this is represented today by the roughly circular boggy area cut into the hillside beside the stream. The area is well trampled by cattle. This would appear to be the most likely location for the well and is shown in the photograph below. After recent very heavy rains the whole area was very wet. 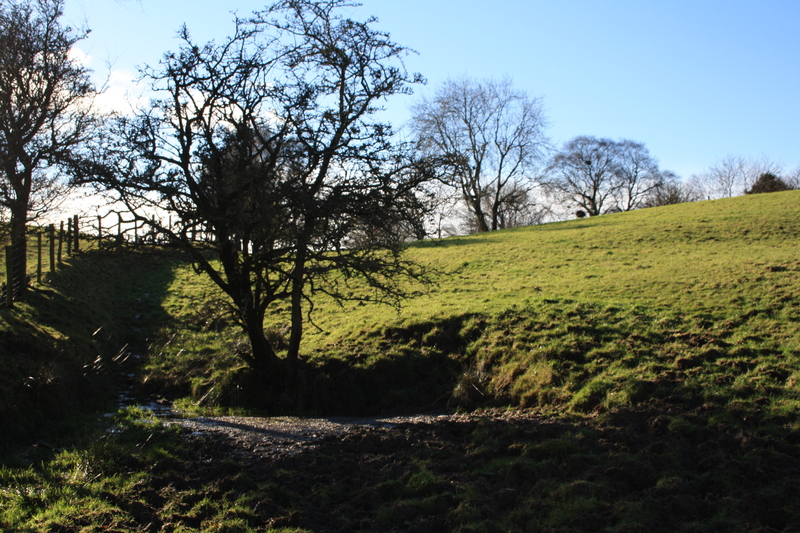 The stream that runs beside the well site appears to originate from a spring in an adjacent field twenty to thirty yards higher up the field. St Trillo made his home at Llandrillo yn Rhos, on the coast some ten miles to the north of this site. This is where his much better known well and chapel can be visited. There is nothing to associate him with Llansannan or the area around this well. I have not been able to track down any traditions associated with the well. It is tempting to assume that Ffynnon Drillo may have been a stopping off point for pilgrims travelling to the shrine of St Winefride at Gwytherin four miles further up into the mountains. However today it remains nothing more than an enigmatic memory, recorded by the Ordnance Survey but few others. There have been other wells in the region dedicated to St Trillo at Rhos on Sea (Llandrillo yn Rhos) and Llandrillo, near Corwen.